I write books for myself as a child: a hyperintelligent little girl looking for new worlds to discover. And, like most authors, I put some of myself in everything I write. I am honored that my worldview appeals to so many demographics. LRR: Your Woodcutter Sister’s series is known for turning fairy tale and gender tropes upside down. Can you tell us a little more about this series, and about how you deal with fairy tale tropes? What is it about fairy tales that make them so alluring and so much fun to play with? A.K. : My favorite thing has always been making up my own fairy tales–a suggestion my mother gave me as a bored 11-year-old. My father read to me every night when I was a baby and I was reading them back to him by the age of three–fairy tales were among these first books. When I was eight, my maternal grandmother gave me a thick book of unexpurgated Grimm and Andersen tales, and I was lost inside those worlds. Essentially, I grew up in the worlds of fairy tales. As authors, we write what we know. Now that fairy tale retellings are now in fashion, I’m having the time of my life. But are my tales retellings? Are they new tales? I’ll leave that decision to the reader. The Woodcutter series takes the premise that all the fairy tales we know and love came from one family, once upon a time. I wanted to speak to the global consciousness and the history of fable. I wanted to get to the heart of storytelling as a whole life experience, like Shakespeare in Love. And I also wanted to give the world a story about a family, who supports and loves and puts up with each other, and who is not conveniently absent (or dead) so that the protagonist is free to adventure as he or she chooses. LRR: What writing projects are you currently working on? A.K. : I’m in the windy gap between turning in Book Three (Dearest, Feb 2015) and diving into Book Four, so I’m trying to clear the decks of a bunch of those niggling side projects that have been impatiently waiting in the wings. 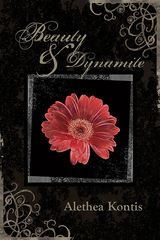 I’m revising a new edition of Beauty & Dynamite that will release this year–along with both its sequels–from Alliteration Ink. I’ve completed a short story and am finishing a novella, both set in the Arilland universe. I also have a few children’s book projects my agent is pursuing. What I’m having the most fun doing right now is my Fairy Tale Rant series on YouTube. Every Monday I discuss a new Grimm, Andersen or Lang fairy tale each week, with amusing category. Sometimes I’m in full costume…sometimes I’m not…but I always have a tiara. LRR: For a while, you were doing a fairy tale podcast. What was your favorite thing about doing the podcast? I learned so much about performing my own audio while doing that podcast. I learned a ton about room noise…now when I’m asked to record a story (and I’ve done quite a few now!) I hide in the walk-in closet with a blanket over my head. I’m still learning to be unafraid of my voice–I have fewer qualms assigning voices to characters when I’m performing a reading aloud than when I’m doing a recording, for whatever reason. And I’m still working on volume–I was a stage performer as a child, and I’ve never really been able to curb that volume. “Projection” is not exactly something a narrator needs when the microphone is RIGHT THERE IN YOUR FACE. 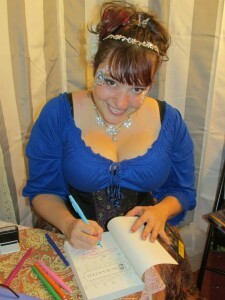 LRR: You do a ton of appearances, workshops, and other book-related events. What’s the secret to doing so many events and staying sane? A.K. : Some princesses have birds and squirrels tending to their every need–I have a legion of fairies (yes, imps too) as well as a contrary guardian angel named Murphy looking out for me. They’ve taught me to embrace the chaos as a lifestyle, which in itself is AMAZING. I can do WHATEVER I WANT…just as long as something gets done. Which is good, because there are a lot of things I want to do…and there’s been a constant stream of events both fortunate and unfortunate that prevent me from having a “normal” day-to-day regime. I spent all last year trying to fight against the forces of chaos when what I should have done was something I do rather well: Go with the Flow. I just make sure to Keep Going. 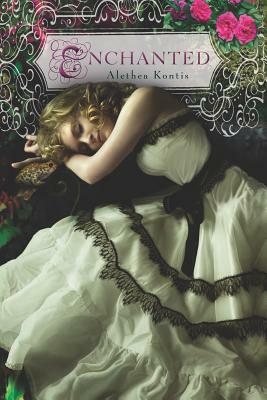 Learn more about Alethea Kontis by visiting her website, following her on twitter, and checking out her Youtube channel! 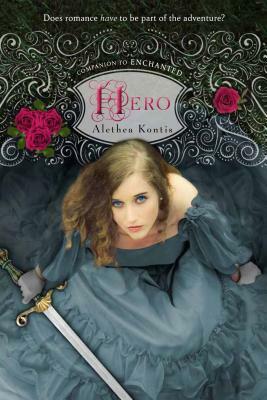 7 Responses to "Interview with Alethea Kontis"
Blood from Stone was great, and this is coming from someone a bit jaded by fairy tale remakes these days. Come to think of it there were a couple fairy tale remakes in this collection that I enjoyed; perhaps I am just a bit tired of long-winded remakes? Have you tried Bill Willingham’s Fables comic series? You might enjoy that…. Thank you, Jaded Sir. It’s an honor! Thank you so much for hosting me — this was a really fun interview! I thought Blood from Stone was a great story and although I enjoyed many in this collection this particular story is the one that kept my attention for days and days after. I just couldn’t help mull it over.